Chess sets are made all over the world, there is a small handful of countries that make most of the worlds chess. Northern India is a very prolific chess producing region. Many of the worlds finest sets of chessmen now come from India. Established chess brands in the USA and Europe source most of their products from the region. The most recognised and popular design of chess set is the Staunton chessmen, designed in the mid 1800s by a member of the Jacques family. Howard Staunton, a prolific chess player of the time gave his name to the set and endorsed the design as the ‘standard’ on which all international chess games should be played. For hundreds of years people have been making chess sets from a variety of materials using a variety of methods. The essential ingredients include a 64 square board and 32 recognisable chessmen. In its simplest form a chess set could be drawn onto a piece of paper and pieces made from small circles of paper. Generally speaking something substantial and longer lasting is required. Wood has become the mainstay of chess set production over the years with materials like bone and stone remaining very marginal. Wood is available in a variety of density and shades and is the perfect material to work with when making a chess set. The Victorians made their legendary Staunton chess pieces from black ebony and pale boxwood, which resulted in a stunning contrast between the black and white chessmen. Making your own chess set is a project that many people embark on, indeed it has become a very popular GCSE Design & Technology project to hundreds of 15 and 16 year olds in the UK. This website will chronicle and detail the many methods used in the production of chess sets including solid wooden chess boards, veneer boards, inlaid boards and the chess pieces themselves. A chess set is something that should inspire you, excite you and create an air of majesty about the wonderful game of chess. Many chess sets have been lovingly crafted from very fine materials and endangered woods and as such will be a treasured possession for not years, but decades and often through multiple generations. It's important to understand the processes involved in making chess sets, where they come from, how to buy them and how to care for them. With most sets being made from hardwood it's important to know how atmospheric conditions might affect your chess set as it ages. While there are many thousands of plastic chess sets produced for competitions and clubs wood still remains the material of choice for privately owned chess sets. Wood lends itself very well to being inlaid which is the ideal method of construction for a chess board. Turning and carving of chess pieces also lends itself perfectly to wood. 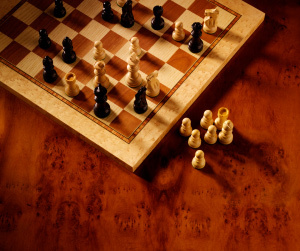 Wooden chess sets can be bought in a variety of sizes and materials, they are items of practicality and desire. Of course the most important thing to do with your chess set is enjoy it.